Memphis is the great cultural phenomenon of the '80s that has revolutionised the creative and commercial logic of the design world. Created on the initiative of Ettore Sottsass and a group of young Milanese architects and designers, shortly to be joined by some of the most famous names on the internatinal design scene, Memphis overturned all the existing preconceptions around the idea of "iving". With Ettore Sottsass as the backbone of the group, Memphis abolished the creative limits previously dictated by the industry, and Design assumed a new expressivity in the form of new shapes, materials and patterns. Thus, the Memphis movement has become an almost mythical symbol of "New Design" and its influence is still strong in many areas of production and beyond. 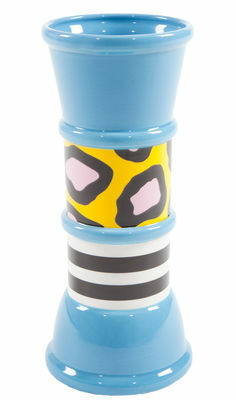 The Carrot porcelain vase was designed by Nathalie du Pasquier in 1985 for Memphis Milano. The transmuted porcelain arises in geometric compositions that expose the humor and poetry of everyday life.